DESCRIPTION: ATOPICA (cyclosporine capsules USP) MODIFIED is indicated for the control of atopic dermatitis in dogs weighing at least 4lbs. CAUTION: Federal (USA) Law restricts this drug to use by or on the order of a licensed veterinarian. Keep this and all drugs out of reach of children. Dosage and Administration: The initial daily dose of ATOPICA is 5 mg/kg/day (3.3-6.7 mg/kg/day) as a single daily dose for 30 days. 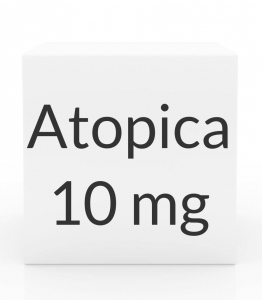 Following this initial daily treatment period, the dose of ATOPICA may be tapered by decreasing the frequency of dosing to every other day or two times a week, until a minimum frequency is reached which will maintain the desired therapeutic effect. ATOPICA should be given at least one hour before or two hours after a meal. If a dose is missed, the next dose should be administered (without doubling) as soon as possible, but dosing should be no more frequent than once daily. Contraindications: ATOPICA is contraindicated for use in dogs with a history of neoplasia. WARNINGS: ATOPICA (cyclosporine) is a potent systemic immunosuppressant that may increase the susceptibility to infection and the development of neoplasia. Not for human use. Keep this and all drugs out of reach of children. For use only in dogs. There have been reports of convulsions in human adult and pediatric patients receiving cyclosporine, particularly in combination with high dose methylprednisolone. Storage Conditions: ATOPICA should be stored and dispensed in the original unit-dose container at controlled room temperature between 59 and 77°F (15-25°C).